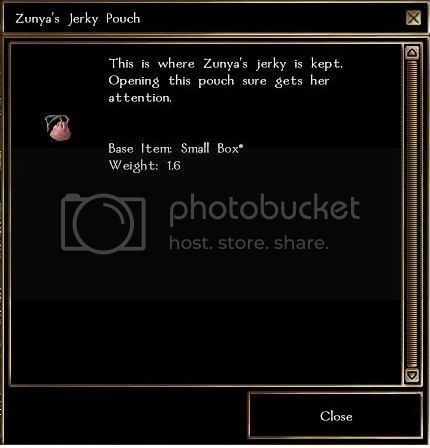 So, I spent a good hour this morning creating an item reward. The player put a lot of thought and work into the RP, so I wanted the reward to be something special and unique to him. The result, I must say, I am pretty darn proud of. 1. This is (obviously) voluntary. 2. 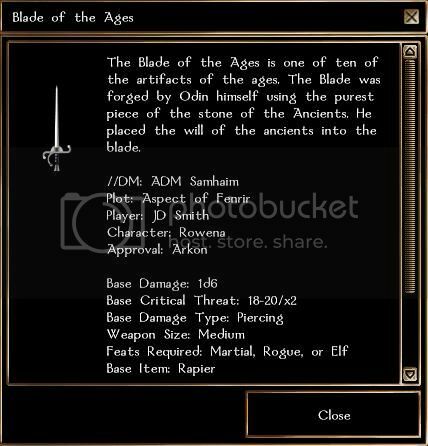 Items should be unique to the character that owns it. 3. 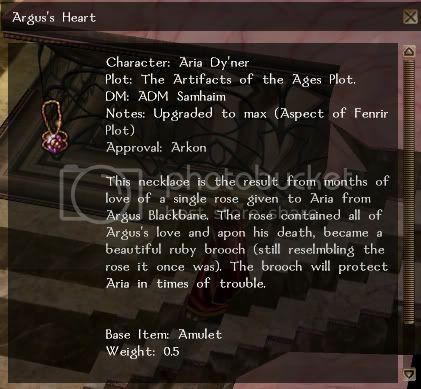 Items should have a unique backstory and/or appearance. I think this is my favorite DM reward of all time of all my characters. It truly has become a part of Aria and her character. It was once joked IC that Seamus has a story for every piece of equipment he owns except his socks. While this is nearly true, some of those items hold special meaning for him. Two of the most recognizable (and most memorable for me as a player) are listed below. Every time Seamus goes to Urend to unload a pile of found items I think about the fact that Urend wouldn't be there but for the efforts of those who went to pull him out of Shaggy's clutches. A high point in Seamus' career and one of my favorite plot rewards. Night's end: Found during one of the pivotal stories in Seamus' existence. The helm of a Paladin turned Deathknight who Seamus freed from his cursed existence through single combat. When we found his helm in the Empress' horde after she fled I was literally in tears. Perhaps my single, favorite plot reward of all time, and the single most recognizable piece of kit Seamus wears. Sometimes he fancies that the spirit of Marduk speaks to him through the helm, and he's not quite the same person when he wears it as when he doesn't. 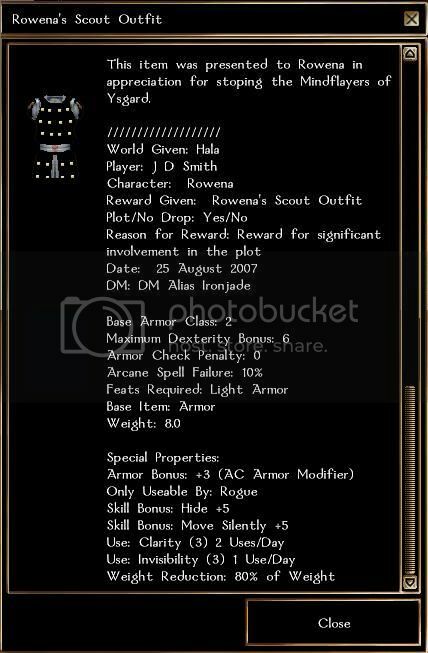 Dune had a real gift for making interesting DM rewards! In fact I'm going to break my own rule here for just a moment to show off one from an early plot. This is not unique, unless Sara is the only one left that still has hers. Even so, she certainly doesn't wear it! What was great about this one? The general consensus on receiving this reward was "eeeeeeew! You really want us to pick those up!? " This is Sara's blade, the one she received when she was knighted. She always has it, even when its not visually apparent, its safe to assume its strapped to her back. His glove which he wears over the top of his gauntlets, just like Michael Jackson! Malik's amulet, while not obviously his, makes me giggle. May well be the first custom DM item I received but Morgans gloves may be older. And finally his armor. No special description or anything like that, but as you can likely tell from the name its been with him a while Of all the items on all my characters this is the one im most proud of. He bribed someone with diamonds to go to celestia and get it for him and has been slowly corrupting it ever since. Most of Jay’s things he’s had long enough they were Avlis rewards but there are a couple. One is his Blessed Feather of Uller. When we brought horses to this plane Jay refused Arkon’s reward as he preferred his existing rings combined with armour/belt/bracers. Jay did have a Scabbard of Tyr though from the Aspect of Fenrir plot and he decided to give that to a Paladin of Tyr. So Arkon created the Blessed Feather of Uller with roughly the same properties as a replacement for Jay. So thanks to Arkon for the quick and hard work making that item on the fly. The other one is Jayem’s Book of Notes. At various points I’ve RPed that Jay is making a note or referring to his notes, including the finding of previous volumes (for recovering the document from the old hard drive). One day Nastr0nd decided to take me at my word and surprised me with an equippable book for Jay with “a lifetime of experiences, musings, and random jottings”. So thanks to Nastr0nd for the surprise. 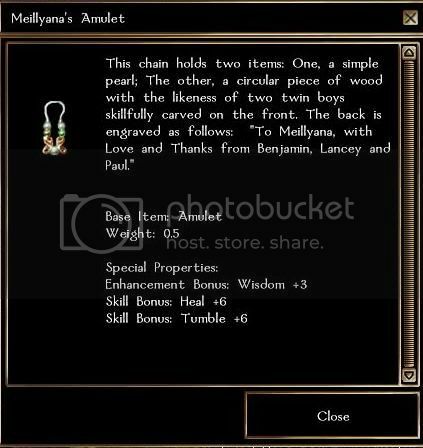 Not a quest reward, unless you consider others having to put up with Sul over the years to be a quest (I know I do), my favourite item he had was given to him by another player “The Amulet of Pure Good”. It could have been without any stats of any kind, but he’d have kept it for its description alone (well worth a read if you ever wondered about him, and then maybe you should wonder about the player that would give it to such a zealot). When holy symbols were released on Hala with their ability to combine with other items. LC helped me out by taking the combined item, transferring the description and renaming it to be “Almara’s Holy Symbol of Pure Good”. I'll get something of Ro's up here sometime when I've really got the time to work on it. Nastr0nd; can your things be made bigger? I'm still using a 13 inch diagonal CRT monitor. Its to small to be read. Yeah - crap; I know. But what's a poor sod to do? Option 1: Use the zoom-in facility of the browser. Option 2: If your browser does not have a zoom then right click, "Save As...", and look at / zoom in on the pictures in Windows Picture and Fax Viewer (or whatever utility starts when you click on them). a little something Ash picked up. The first award for major plot involvment ever (including the previous years spent on Avlis). 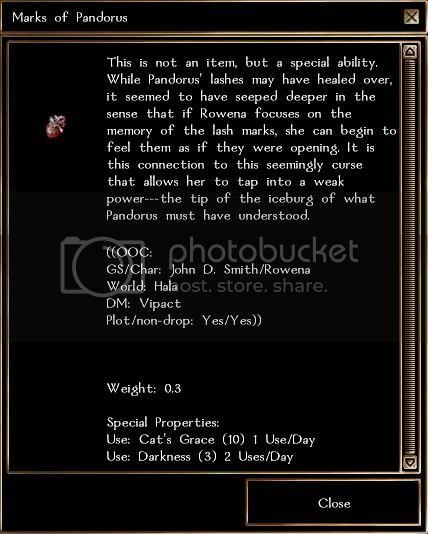 The way Ro recieved it was stated as a gift from the people of Ysgard, for her aid in stopping the Illithid menace; specially made for her by them. When I read that bit; it made me immediately think that it was crafted out of leather made from Illithid skins. I asked the DM about that; and he said it would be ok to claim that was the case. Since then; Ro's been proud of her Illithid Leather Armor. 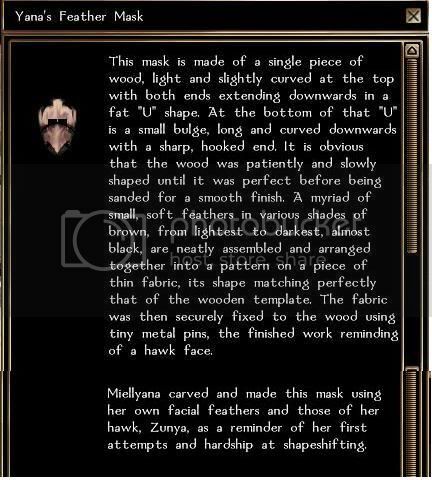 This one, similar to Sara's hands; is not really an item, but is unique to the character. When I first read the description given; I interpreted that as Ro's lash marks still being clearly visible and as she uses the power; she can feel them as freshly made/re-opening again (thus why when she first received this and started using the powers; she'd groan some as she used them). This is also the reason the PC Description (Examine) was made to reflect the possibility of the lash markings being seen. I do believe that this one has to be classified as unique. There! got around to take proper screenies of those items people would recognise Yana by. There are other items she has that are awesome if only for what it means IC, but nothing specific to Yana alone. I'm in a holy thread resurrection mood today! I found this one, and I thought I'd share some of Legs' favorite toys.... however, if you really want to find out what they do, you'll have to ask! All of these have a great story attached to them, even if it's not in the description... well, except for the lolli, cause it's a fake, it does have an actual IG purpose though.